Agglomeration: It is not a word you often hear, but it is quite a powerful concept when it comes to businesses building economies of scale – and one emerging company is rapidly applying it to the fragmented marketing space. The best “agglomerates” are able to concentrate output and assets in particular areas, by which all firms within the agglomerate can benefit. So by bringing in global industry leaders all under one company roof, but let them run their own businesses the way they always have been, it could be considered a recipe for sure fire success. Today’s debt free, profit generating, NASDAQ-listed company is the world’s leading digital marketing and advertising agglomeration. Its primary listing is on the NASDAQ First North Stockholm exchange, and just days ago it also commenced trading on the Frankfurt Stock Exchange, one of the largest exchanges in the world. The cross listing is expected to facilitate growth in a company that is already on a rapid upward trajectory. Having started with four companies, it built up to 19 in its first 100 days of operation and has continued to build since, and continues to deliver value accretive, profitable growth. This company has big ambitions, and with an almost open ended scaling potential, partly due to a lack of ‘indigestion’ problems encountered in traditional roll ups of smaller companies, it’s on track to be the first new company to crack into the Top 10 marketing services firms worldwide. A listing on the NASDAQ main boards also beckons for this fast moving company. However, it should be pointed out that growth and acquisition at this pace and frequency may not continue and therefore investors considering this stock for their portfolio should seek professional financial advice. The new Frankfurt listing is expected to give the company access to a deep pool of new potential investors that will help to expand its shareholder base, increase liquidity and introduce the company to a wider audience across Europe. The company also recently entered into exclusive terms to acquire four new companies adding further digital content development, marketing and advertising capabilities, in a bid to strengthen its offering in the important Australian and UK markets. Once these acquisitions are finalised, which is expected to occur before Christmas, it will bring the company’s wholly owned portfolio of companies to 23 across 46 offices in 10 countries, serving clients across the United States, Europe, Asia, Australia, and New Zealand. What sets this company apart is that all acquired companies are run independently, retaining their unique brands and identities, while benefitting from the scale an agglomeration creates. Another key element, is that this €108M capped company doesn’t just acquire companies for acquisition sake. It is motivated by talent. The companies that make up this agglomeration are run by award winning, high achieving leaders who are best-in-class and have been acknowledged as such. They are authors, key note speakers, Emmy award nominees, VMA winners, Cannes Lions Award recipients, and they all sit on the company board, further strengthening this company’s proposition. The best businesses are those that are highly scalable, and this company has picked up some of the best in such a short amount of time. With an acquisition strategy that should see it continue to incorporate some of the brightest small and mid-tier marketing firms from all over the globe, the company is well placed to continue its expansion in its bid to become one of the most powerful marketing players in the world. 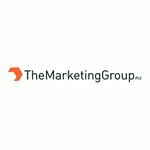 Incorporated in 2015, The Marketing Group plc (ST:TMG; FRANKFURT: 2MG) is a truly global marketing and advertising company that brings together a portfolio of successful, profitable and independent digital marketing businesses, each with unique and complementary products and services. Together these businesses make up a global network offering a full suite of digital marketing and advertising services and are supported by management and coordinating activities as well as a common operating platform. TMG was the brainchild of Jeremy Harbour, a serial entrepreneur who sits on several boards including The MINT National Bank and acts as Executive Chairman for The Marketing Group. The company was created in response to an existing gap in marketing for a group that could support agencies with an operating profit (EBITDA) below £5m that would be too small to appeal as acquisitions to the big holding groups. With his strong M&A background, having done hundreds of successful deals in the past, Harbour proceeded to build an innovative, cutting edge, global creative marketing and digital media organisation that could compete internationally with existing global agencies by offering best in class talent and specialised services. In the following video, Harbour along with Board members including Chris Reed, Global President of LinkedIn Marketing, and Laurent Verrier Global President of Social Media Marketing espouse the virtues of the agglomerate model and why TMG is growing so rapidly. Essentially, TMG brings together profitable, privately held (and therefore illiquid) companies to form a large and powerful portfolio of independent, specialist subsidiary brands servicing blue chip clients. Services offered by TMG include advertising, digital marketing, media buying and production, digital lead generation, brand consultancy, app and game development, e-learning and PR. 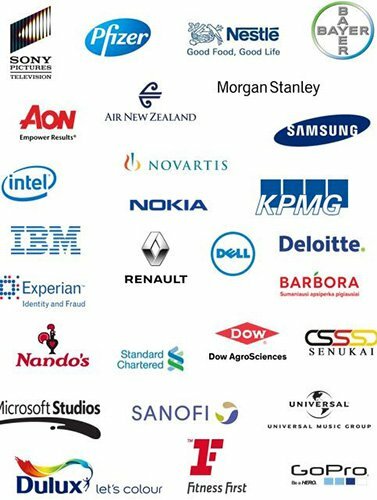 Here’s a snapshot of just some of the clients under TMG’s management. As you can see this is an agglomerate with a serious portfolio of blue chip clients. And now, following its recent move into the ad agency space, TMG is not only looking to expand this portfolio, but also take on the larger agencies such as M&C Saatchi, BBDO, Omnicom and DDBO Worldwide. Agglomeration means to form a cluster. It is an approach taken by businesses to achieve scale, while retaining talent, unique brands and specialised skills and services. Think of it like this: if all the fast food companies in the world came together under one parent company, but were still able to act independently offering their unique herbs, spices and sauces, that would be an agglomerate. And what a powerful agglomerate it would be. Imagine McDonald’s, Nandos, Subway, KFC, Red Rooster et.al., all drawing on the power and unique skillsets each has. That is what TMG is building in the marketing and advertising space: a powerhouse of profitable agencies that can compete with all and any of the majors. 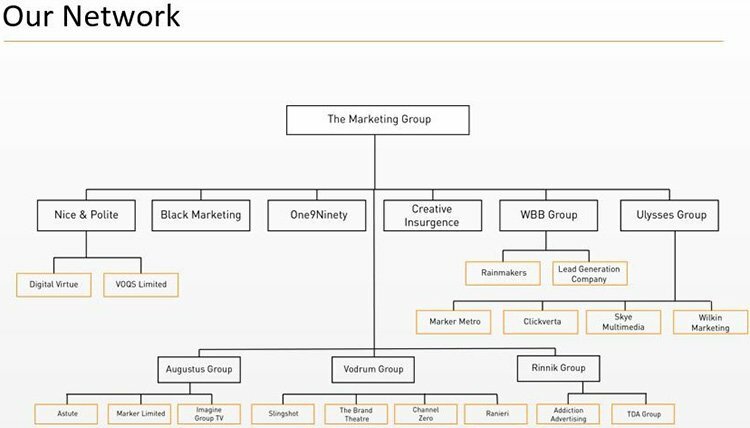 Thus the approach TMG has taken is to acquire mature, profitable, debt free and value accretive businesses that are run by leaders in the field to strengthen its position in key markets: businesses that offer other members of the group specialist skills to draw on, whilst putting TMG on the map as a global, full service 360 degree marketing operation. This last point is important because this value accretive acquisition strategy enables TMG to benefit shareholders through capital appreciation and dividend yield. Bringing these brands together in such a powerful way, has been key to the company’s quick growth and why it is able to bring successful mid-tier companies into the fold. 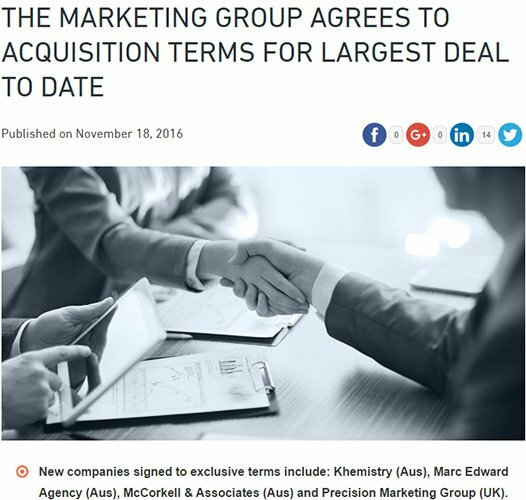 Most recently TMG agreed to acquisition terms for its biggest deal to date. TMG won’t be slowing down its acquisition strategy anytime soon if its latest deal is anything to go by. It is in fact the largest deal the company has agreed to thus far and sets the wheels in motion for further growth in 2017, as it looks to build a track record that puts it on the pathway to NASDAQ’s main boards in 2018. TMG has entered into exclusive terms to acquire four new companies which will bring the total number of wholly owned portfolio companies within the Group to 23. Khemistry Pty Ltd – A Brisbane-based company founded in 2004 that offers brand strategy, brand activation, content development and digital marketing services to public and private sector clients including Queensland Department of Education & Training, Ergon Energy, Brisbane City Council and other Queensland state government departments. Marc Edward Agency Pty Ltd – A Sydney-based company launched in 1996 which operates as a national through the line agency, specializing in “bringing brands to life through the use of people, activation & comms”. Clients include Moet Hennessey, Nikon, Procter & Gamble, Unilever, L’Oreal, and LVMH. McCorkell & Associates Pte Ltd – Another Sydney-based company, this one established in 1991, which delivers end-to-end integrated services under a B2B IT&T marketing umbrella to the Asia Pacific region. Clients include AIG, HP, Telstra, Google, Symantec, LinkedIn, Lexus, and Vmware. Precision Marketing Group Ltd – A UK-based business established in 1994 which provides a range of marketing services primarily to the pharmaceutical sector, including data management, digital marketing solutions, e-Learning solutions and telemarketing. Clients include, Johnson & Johnson, Omega Pharma, Zoopla and Boots Opticians. The acquisitions are expected to be completed on or before the first quarter of 2017 and as you can see they are in line with TMG’s strategy of profitable businesses with blue chip clients. They also add positively to the already impressive financials. Not only is TMG acquiring companies at a rapid pace, its numbers are rising just as quickly. 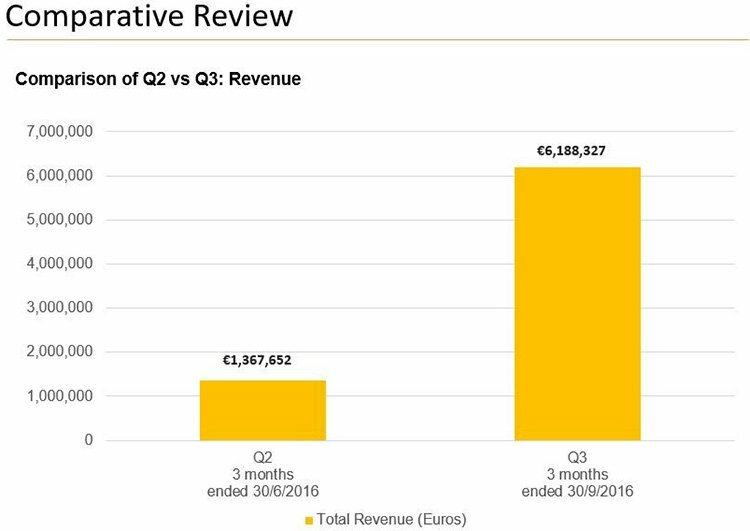 Consider this: in Q2 2016, the company’s total revenue was €1,367,652. Those were the figures at the end of June. By the end of September, Q3 revenue was recorded at €6,188,327 – almost 6 times the number in just one quarter. 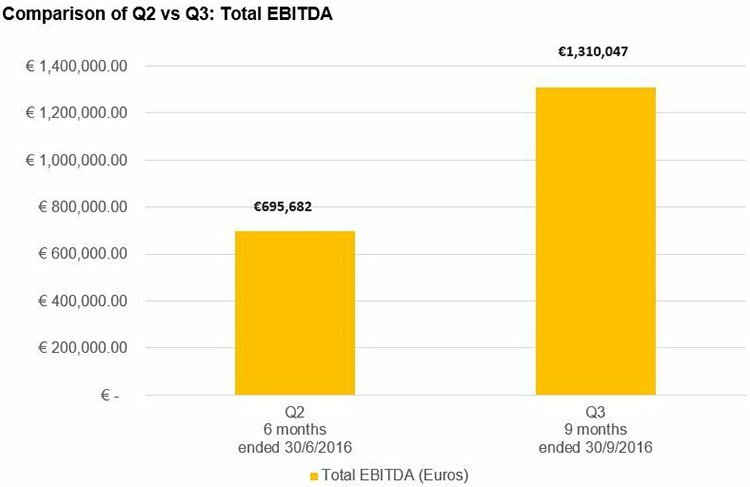 Growth in Total EBITDA is also quite substantial with the company moving from €695,682 to €1,310,047 in the same period. Furthermore there has been an increase in the numkber of countries and companies in the TMG fold and a 54% grown in employees since Q2. In fact, since its initial IPO, TMG has seen 74% growth in employee numbers rising from 65 at IPO to 250 and quickly counting. However this is of course speculation on our part – and succes is no guarantee here, this is still a speculative investment. While its fair to say that TMG has a team of leaders as it goes on making its acqusitions, its direct leadership team consists of some very strong talent. We have mentioned Exectuive Chairman Jeremy Harbour, but let’s look briefly at the others steering the ship. CEO Adam Graham is Chairman of the British Interactive Media Association and before joining TMG was actually looking at starting his own business: Project Oak . 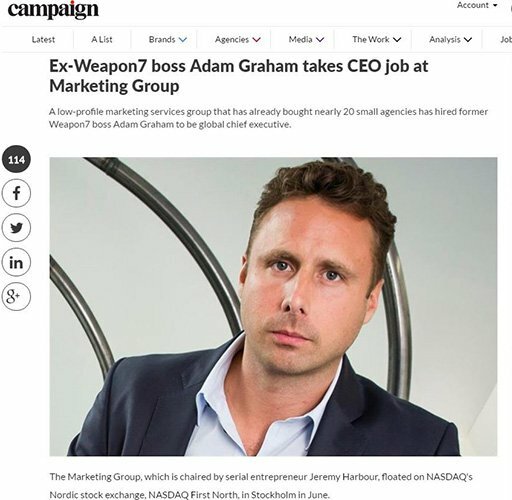 Graham, who was the former chief executive of Omincom digital agency Weapon7, was in the advanced stages of launching a “data-centric” marketing services group to buy up agencies and was in the process of putting together £100M in backing from private equity investors to buy small agencies and scale up. If it sounds similar to TMG’s model, it is. Graham decided to join TMG because its ambitions are similar, it had already raised cash and had a “pipeline” of planned acquisitions. Graham also found the NASDAQ Stockholm float attractive because it maintained that a smaller plc would have more liquidity than on the London stock market, despite TMG being registered and incorporated as a company in the UK. Graham said: “It’s a disruptive new model which is totally aligned to my beliefs that there is a better way than the lumbering bureaucratic monoliths who currently dominate the space. “This model encourages entrepreneurs to continue to be entrepreneurial. We want our agencies to thrive within our light touch infrastructure that encourages them to maintain all the characteristics that made them the great agency they are today, forever more. “How many times do we see the networks sucking in a cool agency only to then homogenise it? So many great agency brands either disappear or become pale reflections of their former selves. Other members of the leadership team include CFO Charles Charles Bartholomew, a Board member of Catalyst (UK) Ltd and WBAC Ltd. and Asia President; and co-founder Callum Lain, considered to be a key person of influence who has built, bought and sold half a dozen businesses in a range of industries across two continents and was partner in a private equity firm Unity-Group. Rounding out the leadership team is European President and co-founder Toby Street, who like Harbour is an expert in M&A and was previously a partner in investor group Unity Group. That is the direct management team, but as stated everyone who joins TMG comes with leadership experience and that experience is used to drive the Group to bigger and better things, including more acquisitions, which leads to bigger profits which ends in better returns for investors. Although the following table doesn’t take into account the four companies that should be on board by the end of the year, it does give you a sense of the length and breadth of this growing business. We won’t go into detail about all of the businesses here, suffice to say the main ones such as One 9 Ninety, founded by Laurent Verrier (who you saw in the video earlier) and counts Volvo and Microsoft as clients, Black Marketing (Oracle as a client), Creative Insurgence (Stella and Jägermeister), Nice & Polite (Disney, Lexus, Sony, Apple), Lead Generation Company (AON, Renault), Rainmakers (Nandos, Bayer) and Imagine Group TV (Fitness First, Dulux), who all bring large clients to the table, and work across very specialised facets of making that in an agglomerate add enormous value. Furthermore each business is highly profitable – which certainly helps! It must be remembered, however, that TMG has only been in operation for a short amount of time and still anything can happen. Investors considering this stock for their portfolio should seek professional financial advice before making an investment decision. What is important for these businesses other than that they can work autonomously is they each have the ability to roll up in their own space and look at their own acquisitions strengthening the group even further. That is the thing about TMG, it is a highly scalable business and the companies on board today, are just at the start of something that can be so much bigger. That is the ethos by which TMG’s Jeremy Harbour lives. Here he is explaining the principles of that very philosophy. TMG was started with that philosophy in mind and continues on its journey unabated. By the end of the year, it will have 23 companies under its banner, all profitable, all looking to acquire their own assets and all sharing the liquidity and spoils that being a public company can bring and that they wouldn’t otherwise have if they had continued operating alone. There is every chance this €108M company will quickly build on its solid market cap as it continues to acquire assets, talent and blue chip clients proving that you really do have to think big to get big.